Rotarians Show Huge Support for Polio Eradication, Again! 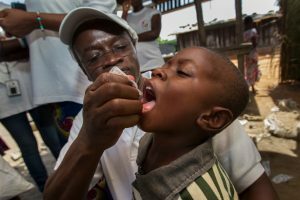 Rotarians around the world are known for their perseverance –and there’s no better example than our commitment to eradicate polio. Over the past three decades, more than 2.5 billion children have been immunized against this dread disease. As we do each spring, we asked you to support this vital Rotary initiative – Polio Plus. And we have exciting news to share! We received a total of $12,225 from 63 Rotarians. The club also donated $2,000 bringing our total donation to $14,225. This will be matched 2 to 1 by the Bill & Melinda Gates Foundation, bringing our donation up to $42,675. The power of Rotary! Special thank you to everyone who donated to this critical humanitarian effort!